A newspaper is opened and shown to the audience. The magician folds the newspaper and proceeds to pour a glass of water into it. Then the newspaper is unfolded and opened and even turned upside down. The water has apparently vanished into thin air. 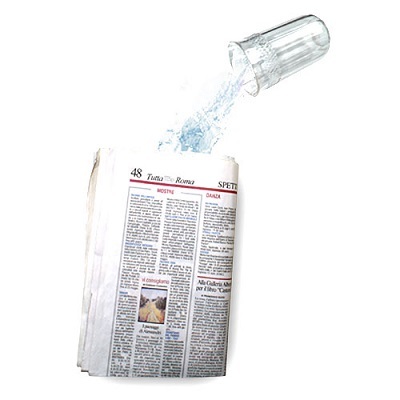 The magician refolds the newspaper, picks up the glass and magically causes the water to reappear from the newspaper pouring it into the glass. • Only the gimmick is supplied. • This is not the cheaply produced Indian item. Made in Italy. • It takes just a few minute to prepare the gimmick, and once in place it does not need to be prepared again.